The Cressi Start BCD is designed for beginner divers. That doesn’t mean it’s not a durable and solidly built BCD. Quite the opposite which also makes it a great choice for rental shops to have. This BCD is simple and sturdy. And it comes at a great price! This makes it a great choice for the first BCD to have as a diver. The bladder is quite large and provides a lot of lift. The Cressi Start BCD is just what the name says. It’s a BCD for beginners and due to the ease of use and sturdy build it’s a great choice for dive shops to rent out. It is built sturdy and with high quality materials that can take a beating. What is lacking is an integrated weight system that you get with pricier BCD’s. It would also be preferable to have metal D-rings instead of the plastic ones on the BCD. Not a big deal but metal simply is sturdier while the plastic ones definitely are of high-quality! All these low-issue complaints aside, you get a sturdy and well-designed BCD for a low amount of money! The Cressi Start is designed as a buoyancy compensator for beginner divers. For this target group it offers everything you can ask for and quite a bit more. One would not expect such a high-quality of a BCD for the price. The materials used are tough and resistant and make it a great BCD for rental shops. The jacket is constructed from very rugged materials, namely 500 and 1000 denier Condura. This piece of equipment can withstand a lot of use and tear without as much as a scratch! The BCD comes with all the necessities you’d expect. It has two large pockets for storage and a number of D-rings to attach small gear. What it does not have is an integrated weight system. You’ll have to look at more expensive BC’s for that. That shouldn’t be that big of an issue assuming that you’re a beginner diver. You most likely got your certification through using a weight belt and are used to that anyway. The Start is reasonably light at around 8 pounds of weight. The lift capacity depends on the size of the BCD you’re getting and goes up to 45 lbs. A nice feature is the large and sturdy handle that allow to pick up the BCD easily. The Start uses Cressi’s power inflation system. It has three over-pressure relief/dump valves. Two are located on the shoulders (one left, one right) and the third is round on the rear of the air cell on the right side. The two shoulder valves can be manually dumped with pull cords. The back one is used through the power inflator system. The BCD has a 3/8” low pressure hose connector allowing to attach it to the first stage regulator. Setup and connection are easily handled even by a novice diver. Cressi's Start has two large side pockets. They close with a Velcro strap and are large enough to keep small dive accessories like a dive light, gloves, etc. In addition there are four D-rings to attach other small dive accessories. Two are found on the shoulders and the other two are on the sides. You can use any of those to attach accessories or snap in hooks for dive gear like a console. They are built from high-quality plastic but are not made from stainless steel! The jacket/harness is easily adjusted to the diver. Similar to most modern jacket BCD’s it offers a 4 release design. The cummerbund is easily adjustable and provides padding for great mid-section support. It also makes sure that the weight is evenly distributed. All straps on the jacket are adjustable to allow you to fit it perfectly. These straps are the sternum straps, torso and waist straps. All straps come with quick-release buckles. The cummerbund/waist strap is independently attached to the back-plate and does not interfere with the air cell. This allows the air bubble to inflate away from the diver without creating a squeeze effect when it gets inflated. 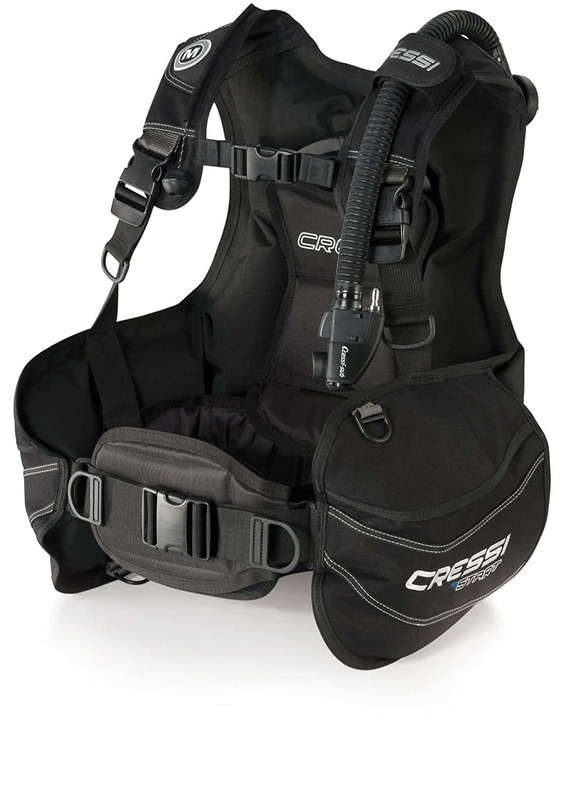 You usually can find the best prices for the Cressi Start BCD on Amazon. There’s also a travel pack with the BCD and regulator and a dive bag available. You can usually save some money on such a package compared to buying all components separately. The overall feedback for the Cressi Start is positive. It’s one of the most reviews BCD’s you can find as it’s a very popular piece of equipment. The only real complaint that we found was that the owner did not get all the air out of the BCD. Honestly, there’s no reason why you couldn’t complete empty the air cell out so our assumption is that it was handled wrong or that the BCD was defective for any reason. The majority of feedback you can find is super-positive. There’s practically no complaints to be found that would prevent you from considering to buy this BCD. If you’re beginning with diving then the Cressi Start is a fantastic BCD. If you’re looking for a back-inflated BCD then you have to look elsewhere. Otherwise, you won’t find anything better for the price! You’ll get a sturdy and well-built BCD that will not let you down for years to come. Eventually you might miss an integrated weight system or would like to have stainless steel D-Rings. However, if you’re used to a weight belt you might never consider another BCD in the first place. You do get a lot of BCD for the money and it’s hard to find a better piece of gear for a beginner!